Form R-1334 is a Louisiana Department of Revenue form also known as the "Commercial Fishermen Louisiana Sales Tax Exemption Application". The latest edition of the form was released in May 1, 2014 and is available for digital filing. 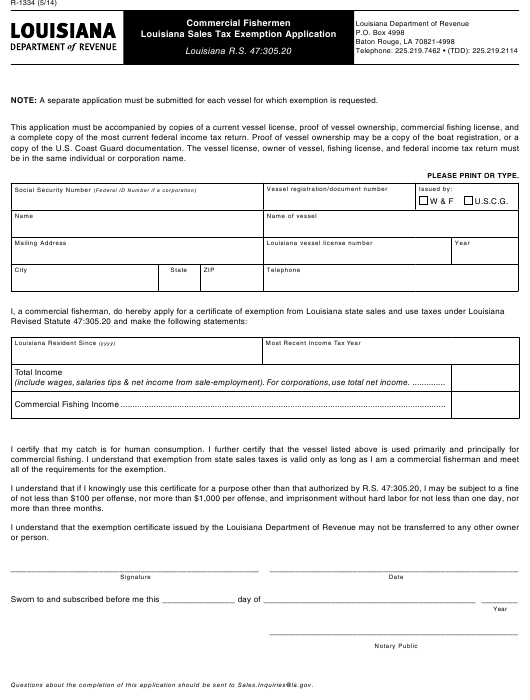 Download a fillable PDF version of the Form R-1334 down below or find it on Louisiana Department of Revenue Forms website. NOTE: A separate application must be submitted for each vessel for which exemption is requested. be in the same individual or corporation name. all of the requirements for the exemption. Questions about the completion of this application should be sent to Sales.Inquiries@la.gov.